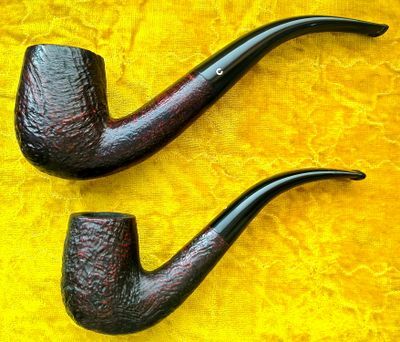 The basis for this article is an excerpt from A History Of Comoy's and A Guide Toward Dating the Pipes written by Derek Green . 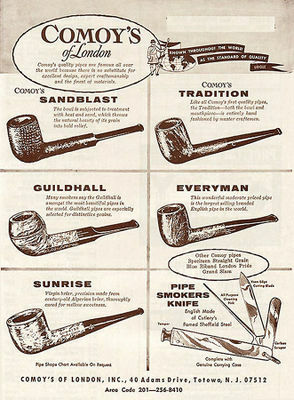 This article was published in the June 2006 issue of The Pipe Collector. 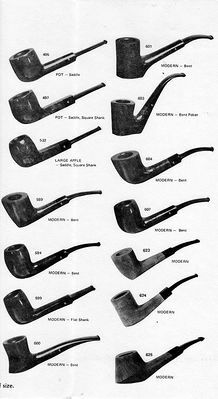 The official newsletter of the North American Society of Pipe Collectors (NASPC), and is used here by permission. 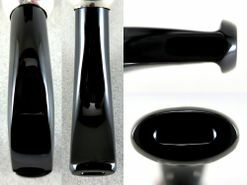 It's a great organization--consider joining. 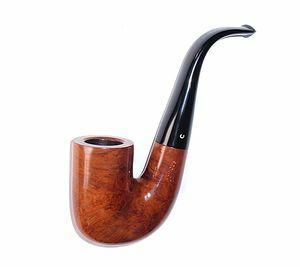 Francois Comoy and his brothers started making pipes (probably clays, boxwood and beech) in 1825 in the small monastic town of Saint-Claude in eastern France. 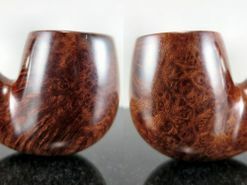 Claude and his son Louis discovered that briar had vastly superior qualities and from 1848 made pipes only in this wood. 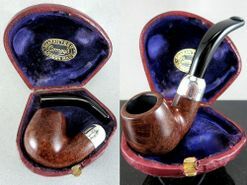 In 1879 Francois’s son Henri, who was born in 1850, moved to London with a small bag of tools, but a great deal of experience. 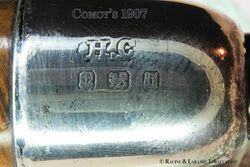 Henri set up a small factory in Seven Dials which is today known as Cambridge Circus. 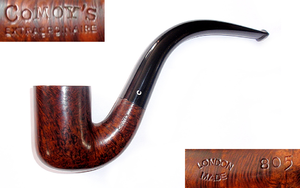 He was one of the prime movers in the establishment of the briar pipe trade in London and is credited with being the author of the appellation “London Made”. 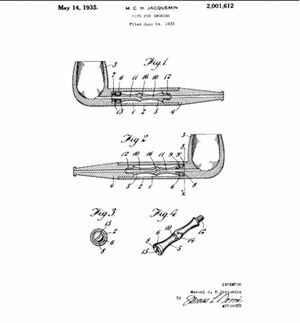 He was helped at first by some of his brothers and around 1891 was joined by his two nephews, Louis and Charles Chapuis. 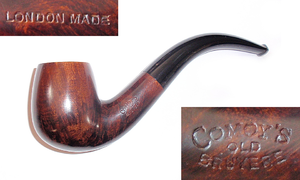 Louis took the name of his adoptive parents. 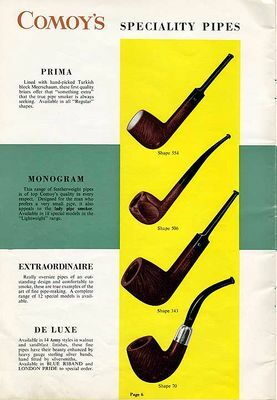 By 1895 the business had outgrown the Seven Sisters site and a new factory was built in Newcastle Place, Clerkenwell. 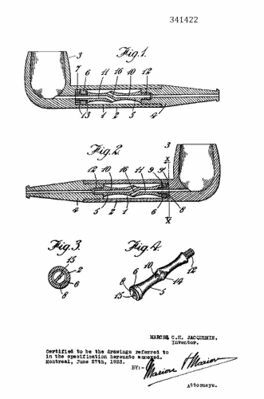 By 1905 markets were being sought in America and the extra business required a new factory to be built in 1913 at 72 Rosebury Avenue. 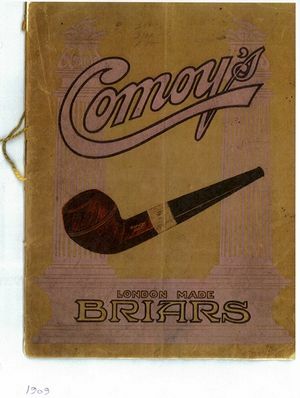 In 1914 the partners, Henri Comoy and his nephews Louis and Charles, incorporated the business as H.Comoy & Co. Ltd. Before the 1914/18 war Henri was also joined by his sons, Adrien and Paul who were born after his nephews arrived in London. 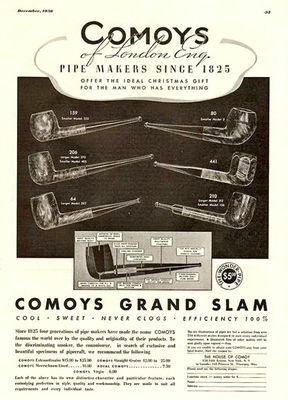 In 1921 Sam Zinberg was appointed Director of Sales for the USA and the House of Comoy was established. 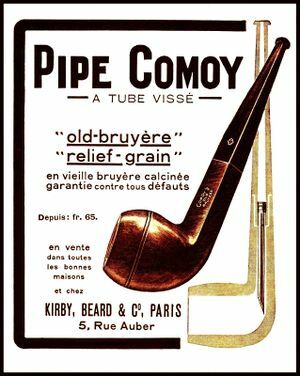 Henri Comoy died in 1924 at the age of 74 leaving the company in the hands of Louis and Charles. 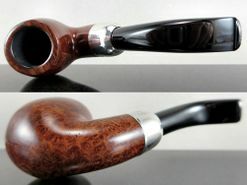 In 1929 the company was invited to join Cadogan Investments Ltd. 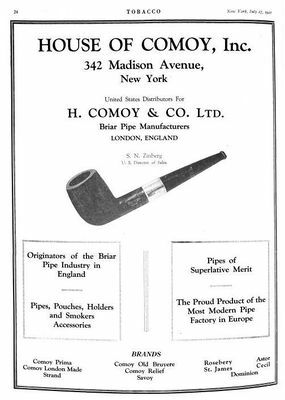 This was known as “The Merger” which consisted of the Civic Company and Oppenheimer Pipes with their associated companies. 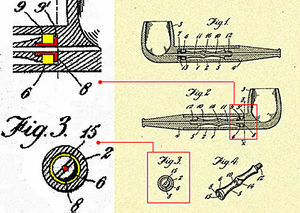 This merger was formed in order to create co-operation between the various companies. 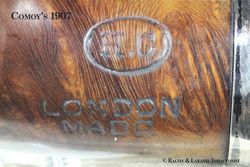 In 1937 a new, model and splendidly-equipped factory was opened in Pentonville Road to accommodate additional staff of several hundred. 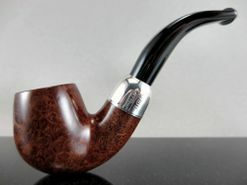 The next generation had joined the firm by the time the Second World War broke out. 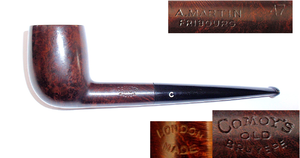 Louis Chapuis Senior joined in 1938 and Pierre Comoy in 1947 after service in the Royal Armoured Corps. 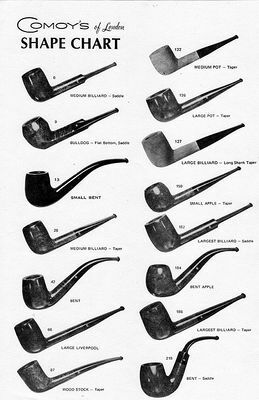 The Second World War was a difficult period for the company, because the whole of industry in Great Britain was turned over to the production of armaments and the war effort, consequently the manufacture of pipes ceased, except for a small workshop. 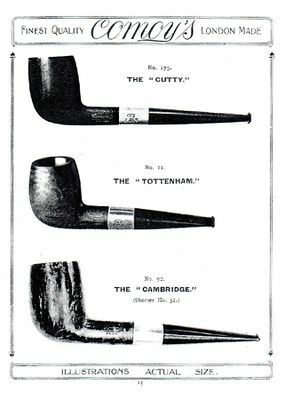 After the war ended in 1945, it was an uphill struggle for all British companies to once again get established, and it was not until 1950, and the opening of a new purpose built factory in Aldershot, that production nearly met demand. 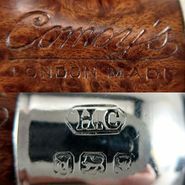 The main manufacturing companies in the merger known as Cadogan Investments Ltd were Civic, Comoy’s and Marechal Ruchon & Co Ltd, and in the early 1960’s manufacture came under one management, but the marketing departments continued working independently for a number of years. 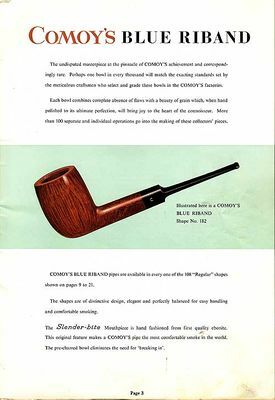 My 1965 catalogue makes the following statement “And now, we the Comoys of the fourth generation, together with those of the fifth, Pierre Comoy and Louis Chapuis, continue to follow the course set by our forefathers, who would be gratified to see our latest ultra modern plant in Aldershot Hampshire.” Comoy’s remained a family owned company until it was finally taken over by Cadogan Investments during the early 1980’s. 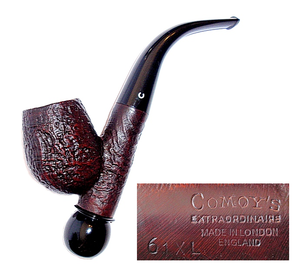 Cadogan have continued to manufacture Comoy pipes to the present day and, under Michael Adler, the Comoy brand is their flagship and efforts are being made to once more re-instate the well known quality of the brand. 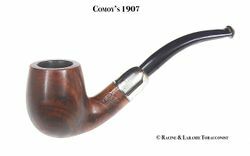 The collector of Comoy pipes is really only interested in those pipes made before Comoy was finally taken over by Cadogan in the early 1980’s and I have therefore concentrated on that period. 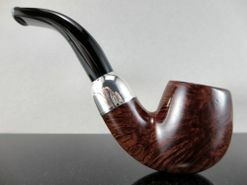 I have also, for the purpose of this article only briefly mentioned some of the other brands made by Comoy’s such as Cecil, Every Man, Town Hall, Guildhall etc, where they can contribute some evidence to help in dating. 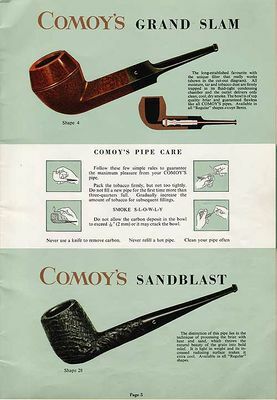 The basis for this article is an excerpt from A History Of Comoy's and A Guide Toward Dating the Pipes written by Derek Green , published in the June 2006 issue of The Pipe Collector. 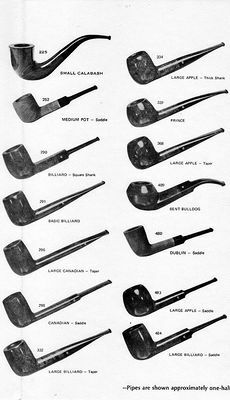 The official newsletter of the North American Society of Pipe Collectors (NASPC), and is used here by permission. 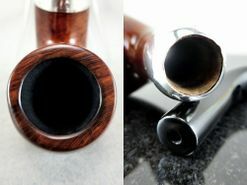 It's a great organization--consider joining. 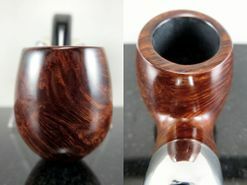 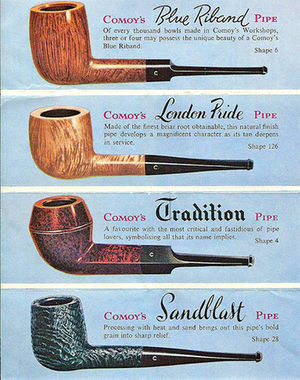 In addition to seeing the complete article A History Of Comoy's and A Guide Toward Dating the Pipes here on Pipedia, more detailed information on Names, Grades, etc., as well as photo examples can be found at Derek Green's Website. 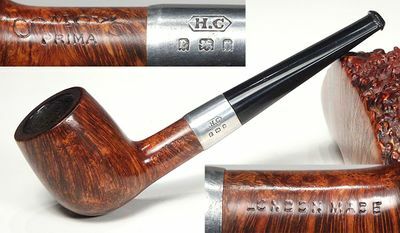 Greg Pease has a nice collection of Comoys, some excellent examples and photos of which can be seen on his website. 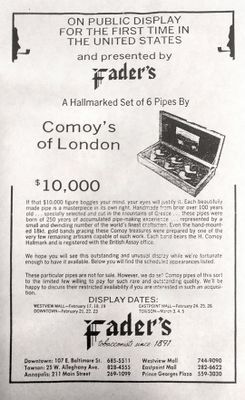 Fader's Ad featuring a set costing $10K!